What a journey we have had, from first hearing in February 2017 of our invitation to sing in Carnegie Hall to our fundraiser concert in June to all the rehearsals starting in September and culminating in our concert on Sunday evening November 19, 2017! Our first rehearsal in New York was on Friday at 8:15 a.m., quite early for those of us from the West Coast! But as soon as we experienced the power of singing with 270 others, we were awake and ready to go. This first day was a 4-hour rehearsal with just the choir and accompanist, who had nothing on our own Amelia Han Riegert for whom we are very grateful! We found the conductor, Mark Hayes, to be personable, patient and knowing exactly what he wanted out of the music. The second 4-hour rehearsal was on Saturday at 12:30 p.m. For me, the most thrilling moment of the weekend occurred at the end of warm-ups. The gentlemen running the warm-ups said, “OK, we’re going to sing ‘Amazing Grace.’ Pick your part.” Then 270 people raised their voices and sang their hearts out – a truly moving moment. During this rehearsal, we sang with the soloists. 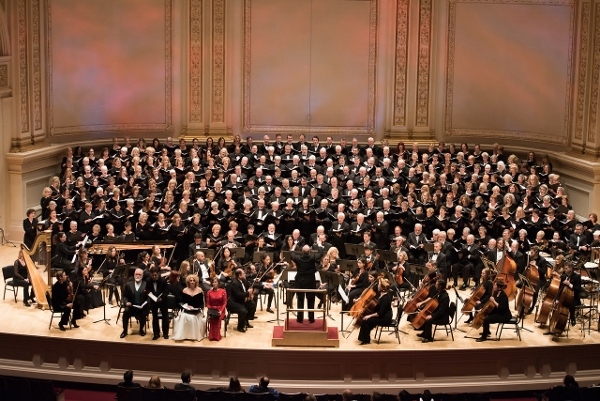 As Sunday rolled around, we couldn’t wait to get on stage and experience the thrill of singing in Carnegie Hall. Our dress rehearsal at 5:45 p.m. was quite the experience. We got our exercise as the gathering rooms were up several flights of stairs. Then we got our first glimpse of the hall as we filed back down the stairs and onto the stage. Wow, what a beautiful concert hall! And, what a huge choir we were – we barely fit on the risers! Finally, it was time for the concert. In our concert dress we made our way across the street to Carnegie Hall, got in formation and waited for what seemed like forever. When it was time for us to go onstage, we were delighted to see that the hall was fairly full. As we sang “The International Carol Suite” with 270 singers, 4 soloists and an orchestra of about 35-40 members, the time passed in a blur. The choir did extremely well, especially given the short time we had to pull this 50 minute work together. Then, all of a sudden it was over. Fortunately, DCINY knew that we couldn’t just end with the concert. They had planned a full dinner reception for us, a time to unwind and socialize with more of our fellow singers. It was a fitting way to end a weekend of singing and bonding. Our trip to New York was an experience we will never forget.